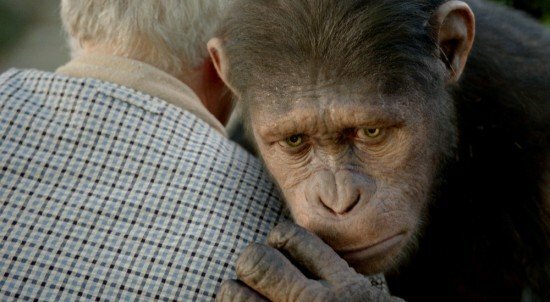 Director Rupert Wyatt deserves some praise for being able to catch all of this on camera and making an Apes story worth telling and worth revamping a dead franchise. Buy this Blu-Ray and don't look back. It's worth every single penny. This past summer had two films that were huge gambles on the studios part. The first was X-Men: First Class; a prequel to a series that ended on a really sour note thanks to a horrible third entry followed by an even worse origins story. The second film was Rise of the Planet of the Apes. The most controversy came from the choice to digitally create the apes instead of using practical effects like make-up and costumes. The films general existence and its lengthy title also came into play, but most weren’t expecting much from either of them. To our surprise both ended up being great! First Class was proof that with a good script, a great director and two excellent performances you can in fact overcome some tough obstacles set in place beforehand and Rise was a chance for the Apes series to rise up once again! Will Rodman (James Franco) is a young scientist with a goal to find a cure to Alzheimer’s. His father Charles (John Lithgow) has it and its slowly eating away at his brain while Will struggles to find the answers. Hope comes in the form of a baby ape named Caesar (Andy Serkis). Caesar’s mom was exposed to a drug that was passed down to him after she died during a lab experiment/presentation gone wrong. Will takes home Caesar after his boss ordered all of the apes to be killed. As Caesar ages so does his strength. Will understands this, but with his sick father and trying to cure Alzheimer’s he just has too much to handle. 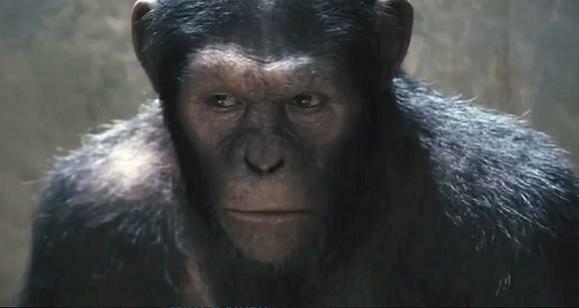 Caesar is forced to leave Will’s home and become integrated with regular apes. Caesar continues to watch the other apes and eventually learns that a small cage can’t hold them for much longer. He carefully plans an escape to freedom and thus starts the rise of the apes! 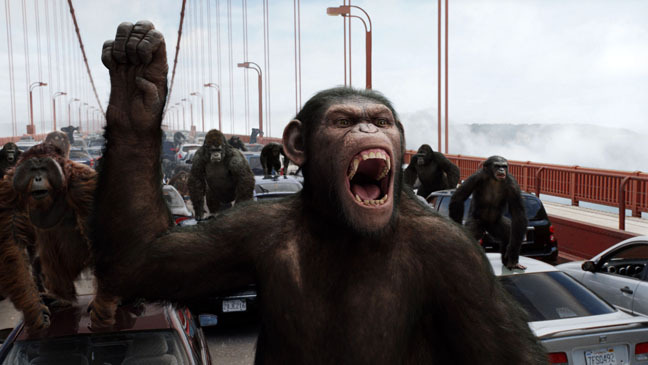 Not much can really be said about Rise of the Planet of the Apes that hasn’t already. Andy Serkis provides a jaw-dropping performance as the motion capped Caesar. He transforms the digital creature into something living and breathing. He breaks the barrier that’s been firmly set in place since animation has mingled with films. Not once do you question the intentions of Caesar because Serkis skillfully displays a wide range of emotions. He not only uses his heart and soul to convey these emotions, but he also strategically uses body movement. The slightest movement in his eyes or face is more important than what most of the other characters in this film do throughout the entire running time. Rise also consists of a supporting cast with the likes of James Franco, Freida Pinto, Brian Cox and John Lithgow. The problem with them is their characters feel very repetitive and often times dumb when in the shadow of Serkis. For playing such a smart scientist Franco’s Will is kind of an idiot when it comes to basic human emotions. That’s even touched upon in the film and never fully corrected. Everyone in this film just sort of exists so that Caesar can have a purpose to do what he does. Rupert Wyatt and WETA Digital must also be praised for their important roles in the film. Wyatt directs Rise with a good eye for visuals and an even better eye for story. He doesn’t swap important character scenes for Hollywood action. Rise is a very tame film for the most part, but when the action picks up it has purpose and that purpose transforms the film into something really special. WETA must be congratulated for providing some truly stunning effects for the apes. They’re full of precise detail and they feel like actual characters and not just special effects. I’ve never been a fan of the previous Apes films and after watching Rise I can safely say I’d welcome a sequel with open arms as long as Serkis returns. The film is a dramatic character piece that focuses on Caesar and his rise. When the action comes into play you’ll be throwing a hand in the air supporting Caesar without hesitation. Rise isn’t a perfect film because of how it heavily relies on its star to carry some of the weaker points in the film, but that’s a small complaint on a grander scale. Fox transfers Rise of the Planet of the Apes with a powerful 1080p transfer that captures every single detail of both the apes and the humans. The special effects look even better than in the theaters and this spotless transfer helps close the gap of what’s real and what’s computer animated. A good 90% of all the special effects look incredibly realistic and detailed with a few iffy spots coming in every once and a while due to lighting and placement. Skin tones are natural and the film seems to be sporting some minor grain. The film comes with a 5.1 DTS-HD Master Audio track that comes blaring across the speakers with crystal clear sound. The track is constantly on the move from forest to laboratory. Dialogue comes across the front channels without any interruptions and the back channels pick up the active environment noises. Things like birds chirping and kids playing can be heard while Caesar looks out the window and shattering glass and apes roaring help bump the track up a few notches towards the end. There is never a dull moment throughout the entire film for this track, which is great if you have the setup to enjoy it! Fox packages the disc with a good set of extras that don’t really stray away from stuff you’ve already seen in the film. They’re interesting pieces, but not all that extraordinary. Check out the full list below. It’s no surprise that Fox took extra special care of Rise of the Planet of the Apes when transferring it over to Blu-Ray. The summer blockbuster is sure to be a popular stocking stuffer this holiday season and it should be not only because it’s a great film, but because it’s a great Blu-Ray! The disc comes with top notch video and audio transfers as well as a fine slew of extras. To top it all off there is a DVD and digital copy included in the package so you can view it where ever you want! I really enjoyed the film, mostly due to Andy Serkis‘ powerful work as Caesar and WETA’s impressive technology, combined the two make for one hell of a team. Serkis provides the heavy emotions and strong character work easily worthy of an Oscar and WETA provides a new field to capture the performance like never before. Director Rupert Wyatt deserves some praise for being able to catch all of this on camera and making an Apes story worth telling and worth revamping a dead franchise. Buy this Blu-Ray and don’t look back. It’s worth every single penny.